Depending on the size of your frying pan, you may need to cook this dish in two batches. Heat a dry frying pan over medium-low heat, then add the pine nuts. Allow to toast until golden, about 5 minutes; stir or sauté every minute or so to prevent burning. Remove from the pan when toasted and let cool. Warm 2 tablespoons of the olive oil over medium-low heat in a frying pan, then add the sliced onions and a pinch or two of salt. Cover and allow to cook slowly over medium-low heat until caramelized, about 30 minutes. Stir every 5 minutes, each time adding a bit of water if needed if the onions begin to dry out. Remove from the heat when the onions are brown and soft. In another frying pan, add the remaining 3 tablespoons of olive oil, and warm it over medium heat. Add the chopped garlic and sauté until golden, then remove the garlic and reserve it on a plate. Add the Brussels sprouts, cut sides down, in a single layer. (Some leaves may fall off; add these too.) Sprinkle evenly with a few pinches of salt and pepper. After a minute, check to see if the cut sides have browned. 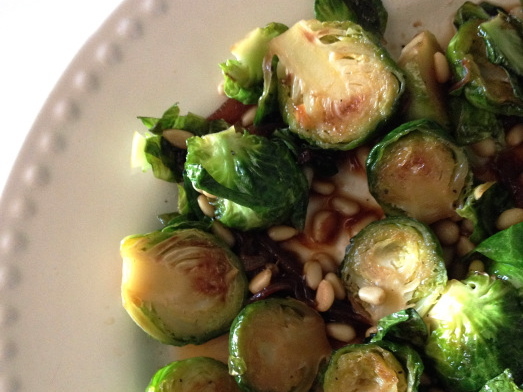 When lightly golden, turn over the Brussels sprouts with a spatula. Add the maple syrup, stir, and increase the heat to medium. Cook, uncovered, until the syrup begins to bubble, a minute or less. Turn off the heat and add the previously sautéed garlic, the caramelized onions, and the toasted pine nuts, and toss everything together. Serve immediately.